Wireless audio may be what big tech is pushing, but most headphone manufacturers will be all about the headphone jack for some time to come. Wired or wireless, things have gotten a little more complicated so here’s what you should know about listening to music on your phone in late 2017. Ever since Apple famously removed the headphone output jack, HTC, Google, and now Huawei have followed the lead, giving ol’ jack the boot. Whether you’re a bona-fide audiophile or just happy that your pair of Beats works with whatever came in the box of your latest smartphone, you wouldn’t be alone wondering what’s the best way to listen to your favorite tunes on your phone considering all the options currently out there. Smartphones now offer a variety of different ways to handle audio for music listening but it all comes down to two main cases: wired using the 3.5mm headphone jack, or wireless via Bluetooth and in some cases over WiFi. Yes there are wired Lightning and USB-C headphones but for the sake of simplicity (and sanity), I won’t be adding those in the mix here as these aren’t as widespread and likely interim solutions for big tech’s wireless agenda. Before even deciding what headgear to use though, there’s a bunch of variables you’ll need to consider that play a role in your listening experience. When deciding what headphone solution works for you, it’s important to think about your listening habits first, and how they can affect overall quality. Digital audio starts at the quality of the source, so if you listen to music from .mp3s or through streaming services like Spotify and Apple Music, remember your source is already ‘lossy’ or ‘compressed’. This means the audio’s file size is smaller and optimized for fast data transfer. Compressed audio tends to remove a lot of the music’s dynamics and ‘body’ as opposed to ‘lossless’ audio formats like .wav, .flac, and .alac, but compressed audio is also quite ‘plug-and-play’ for the casual listener—the formats are ubiquitous and actually capable of sounding great for everyday listening. Now to get any music heard, your audio falls into the hands of the all-important DAC or ‘Digital to Analog Converter’. Fun fact: DACs are everywhere and they’ve been with us since the CD player came out. They’re the component that processes information from a digital audio source into an analog audio signal that speakers or headphones can reproduce. 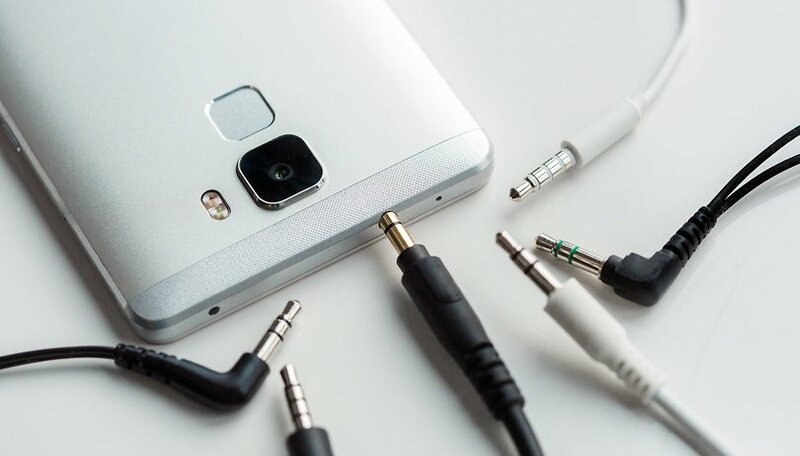 Every smartphone has a DAC built-in. But now, some dongles do as well. If you have an iPhone 7 for example, you might still be using the ‘courtesy’ Lightning to 3.5mm audio jack adapter that came with the phone to connect your wired headphones. The adapter translates the audio signal because there’s a special DAC on the Lightning side of the adapter. Even the most basic DACs are well suited to playing compressed or ‘lossy’ music so if you aren’t exactly an audio nut, there’s no reason to complicate things by looking at this spec when buying a phone and might as well use the Lightning wired headphones that came with that iPhone 7 instead of the dongle. But if you simply like better than average sound, smartphones like the LG V30 and HTC U11 are good examples of manufacturers going the extra mile to please music fans by integrating better DACs and software features in their flagships. The V30 in particular prides itself in housing an ESS Technology ES9218P Quad DAC with a 32-bit interpolation filter when listening through the headphone jack. And Both the LG V30 and HTC U11 feature advanced software features to customize and enhance the listening experience. So if you don’t like the idea of carrying around dongles, should you go wireless? If you ask Apple or Google, the answer is a definite yes. But you knew that would be their answer already. Sure, Bluetooth audio is improving with new high definition codecs like Qualcomm’s aptX HD and Sony’s LDAC now making their way into devices. But it’s still got a ways to go to match the diversity (and convenience) of possibilities available with standard wired setups. Bluetooth enabled devices work by emitting short-range radio waves that receive or transmit digital data—such as an audio signal. What you might not know is that no matter what level of audio quality the input is, any Bluetooth audio codec will always output lossy audio—even aptX HD which confusingly enough, is technically “near lossless”. These limitations we currently have with Bluetooth are probably because it was never designed specifically for music. It has its roots in military voice communication but as we know, it has grown past it’s single use case and now used to transfer all sorts of data wirelessly. That doesn’t mean the wireless headphones already available aren’t good though. Major headphone brands like Sennheiser, Bose, Sony, Bowers & Wilkins, and more have already begun releasing premium and mid-level wireless models. So if you’re not particularly attached to the headphone jack and want standard or above standard lossy sound from your smartphone, you already have some pretty impressive options like the Sony MDR-1000XM2, and the Bowers & Wilkins PX. Bluetooth headphones: No strings attached? But as with any transitional moments in tech, there is an adjustment period. And when it comes to wireless audio, there are already some points you need to bear in mind. On a convenience level, wireless headphones may seem like a dream. Just turn on the cans, put them on, and listen right? The reality right now though is that you’ll have to deal with a lot more variables in the setup. For one, you’ll now have two batteries to keep an eye on instead of one—keeping the headphones battery charged will be essential unless the headset (and your smartphone) has ‘backup’ wired connectivity options. I'd rather risk a tangled wire than worry about running out of battery. And depending on a host of different factors that can cause interference, you may occasionally find yourself at the mercy of choppy streaming or fickle connectivity as any wireless connection would. Not to mention that even if your phone is already paired with some wireless headphones, there’s always the possibility interference would cause some delay in establishing the connection. And if you’re excited about being able to listen with a newer high-quality Bluetooth codec, just because your smartphone supports the desired format, doesn’t mean all wireless headphones do as well. Sony’s LDAC codec is incredibly performant firing up to 990 kbps of data transfer. But until Android Oreo came out, it was only available on other Sony devices and the core tech is still very hush hush under Sony’s control. LDAC in particular also has three connection modes that dictate the level of streaming quality—adding another level of complexity. See where this is going? We mere mortals may not have much stake in the eradication of headphone jack from smartphones, so it’s likely there’s no use in fighting it unless brands like LG continue cultivating a nested niche by including the 3.5mm headphone jack as a new ‘premium’ for their flagships. And let’s be honest, for the first time in ages tech companies are truly interested in advancing audio for every kind of listener so there’s surely better in store for the future of wireless. But it’s clear that lines have been drawn in the sand. Until now, the little 3.5 mm stereo jack was the emblem of a truly democratic audio universe. Any audio device with the analog input or output could be interconnectable. That meant any product across consumer, hi-fi or pro audio industries would be interchangeable in a truly universal way. Given the intricacies of audio streaming and their dependence on active control from a smartphone’s OS, wireless headphones may be most appealing if you’re already a tech-savvy listener who doesn’t mind tinkering with settings and following something of a ‘process’ no matter how minimal. Nevertheless, you’d still be hard pressed to find anything more simple and instant as plugging in a wire, putting your headphones on, and hitting play. What’s your current preference? Are you totally sold on wireless audio or are you sticking with the dongle solution for the time being? There's too many cons to wireless headphones, they can run out of battery, they make your phone run out of battery 10x quicker, the price is higher and they will need to be replaced more often as the in built battery would only last 1-2 years. Also let's not forget the radiation going into your head, could be a wave of people with cancer in 10-15 years because of them. I'm all for removing obsolete things from technology, but the headphone jack is years from being obsolete. Ok, the do offer few hours of battery times, good enough for most (not for me personally, and not for many travellers), but...do you really need one more thing that you have to charge every day!? Than, most of them don't have removable batteries, so we shoud buy a new devices every 2 years, and they are not any cheaper then headphones with a cables that lasts for years. So, I guess that there is many people that doesn't really need audio jack, or a headphones for a phone...but the ones that does, do appreciate device with it. Pairing the headphones when you have 2 phones and 1 laptop gets confusing sometimes. Wired headphones are always better except when you can't cope with cables. I love to have headphone. That are cool to mine!